In this article we are going to cover 3 and last type of C. Compare Database. 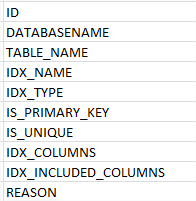 This SQL script will compare table columns, Index and foreign keys in two databases, I am planning to continue this further to add more and more options to this. This will show a result with missing objects and the objects with definition mismatch. INNER JOIN #TABLIST_TARGET TT ON TS.TABLENAME = TT. INNER JOIN #TABLIST_SOURCE TS ON TS.TABLENAME = TT. INNER JOIN #IDXLIST_TARGET TT ON TS.TABLE_NAME = TT. INNER JOIN #IDXLIST_SOURCE TS ON TS.TABLE_NAME = TT. Hope you will like to Script of 3 and last type of C. Compare Database.